Great green dress on Melania Trump! Photo by EPA. 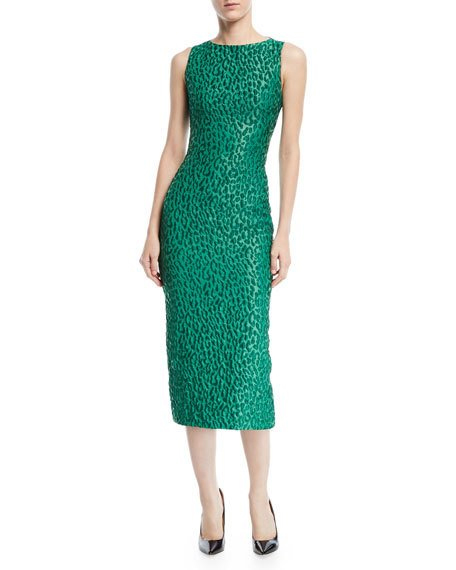 I really loved the green leopard jacquard dress by Brandon Maxwell that First Lady Melania Trump wore to greet the Irish Prime Minister Leo Varadkar on his visit to the White House a few days ago. I figured Mel was in hiding since it seems the White House is in disarray (I am back to not watching the news, I can’t take it anymore), so it was a nice surprise to see her looking so elegant in this unusual dress. 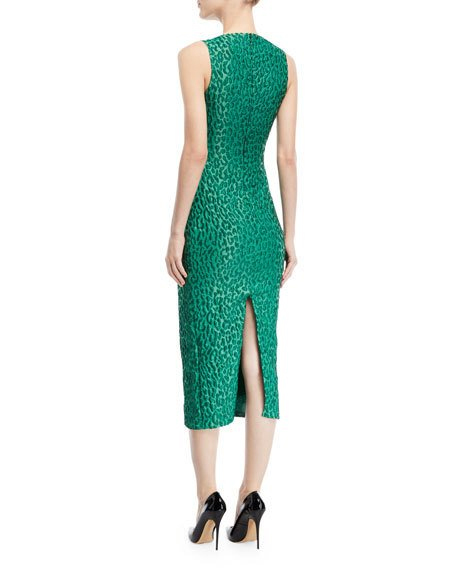 Love the lines of this Brandon Maxwell dress. Here are the photos of it from the Neiman Marcus website. The fabric is outstanding and I love the longer length and high slit in the back. I continue to think her stylist, Hervé Pierre, is making such great selections for her. A photo of the back. Great hat, earrings and hair on Kate. William looked good too! Photo by Tim Rooke/REX/Shutterstock. 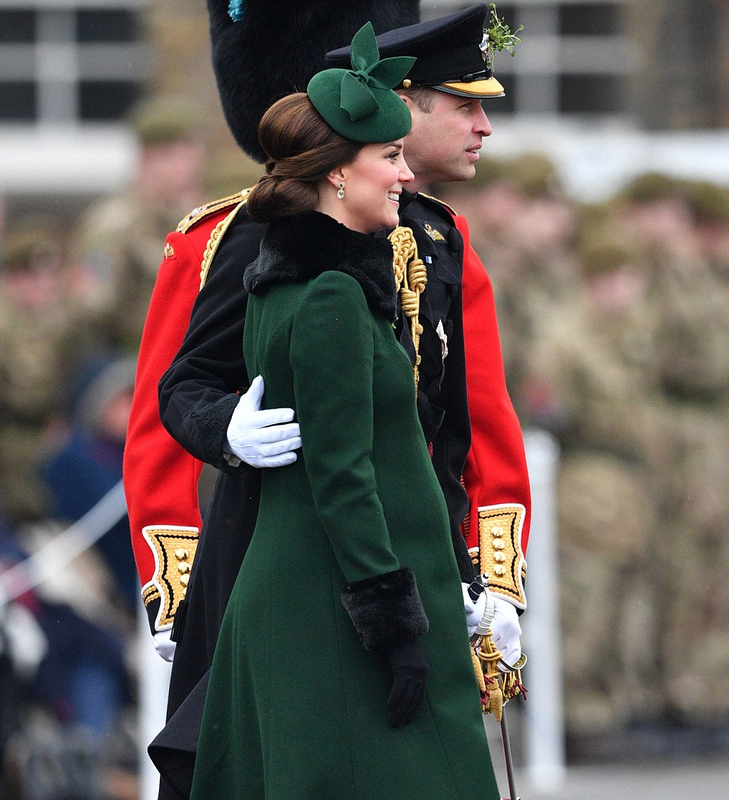 Kate and William attended a St. Patrick’s Day Parade today and Kate wore a green Catherine Walker coat with added black fur collar and cuffs. She looked very nice. I will leave this to people who are better at predicting than I am based on the way she is carrying—is Kate having a girl or a boy next month? Since she has one of each I am kind of over it. Just get me to that Royal Wedding in May! Kate and Domhnall. PA Photo. 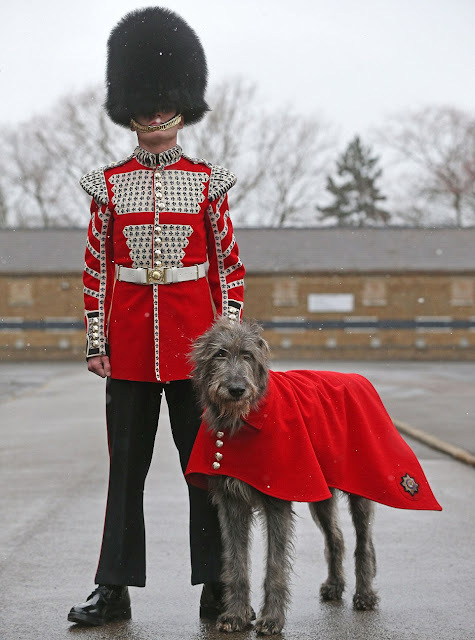 A creature NOT in green was the beautiful Irish wolfhound Domhnall who is the mascot of the Irish Guards. Such a good-looking dog! And he is wearing his own bespoke red coat. For me, he is the Best in Show! Domhnall and his handler Aidan Cathcart. I love this picture! PA Photo. Those eyes! What a beautiful dog. PA Photo. Let me know what you think of these looks, either on the ladies or the canine! Happy St. Patrick’s Day to you. I have to get my little Irish stepper ready for her own parade here in Brooklyn tomorrow. Erin go bragh! 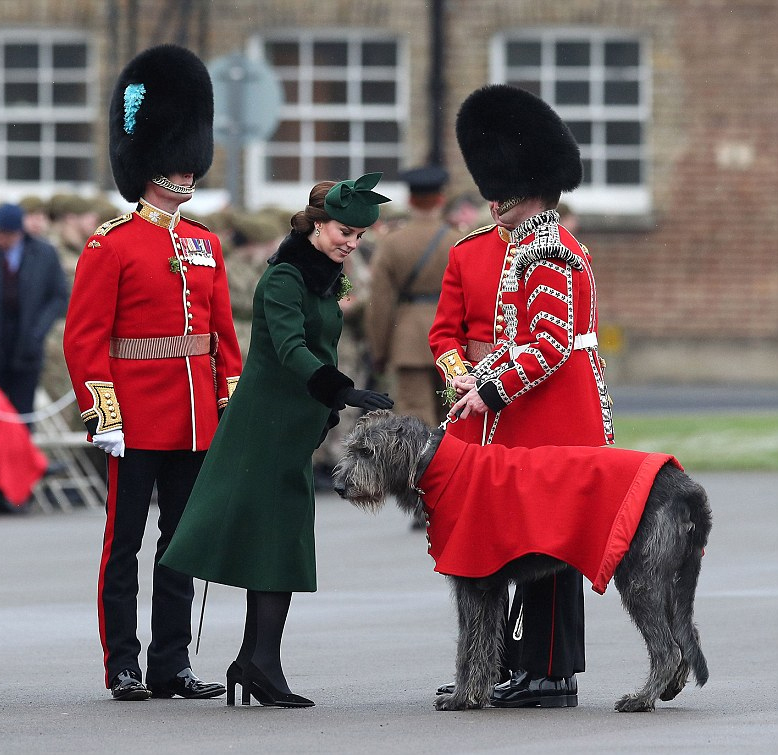 Oh yes Melania looked FAB in that green dress as does my K-Middy with the Wolfhound. Both very elegant ladies. I am with you regarding the news. That green dress is just fabulous. I am very partial to jade green, not just on St, Patrick's day. Melania does know how to rock it. Watch much less news - just can't handle it any longer. 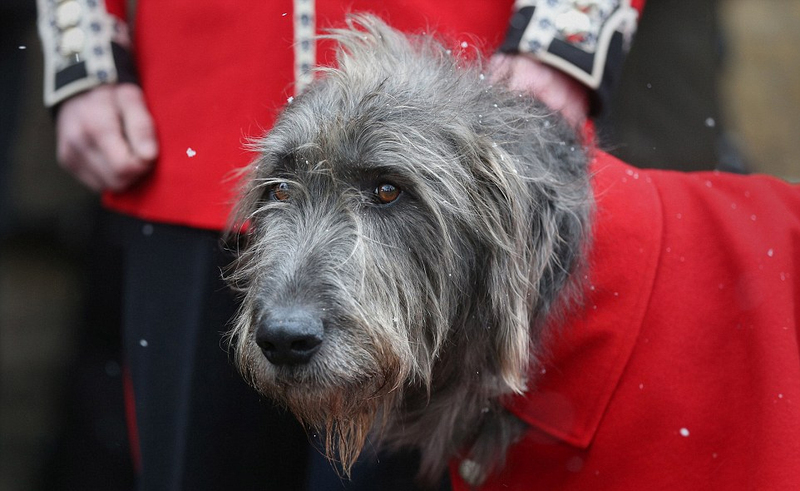 That Irish Wolfhound, Domhnall is quite handsome & his handler Aidan isn't too shabby, either. 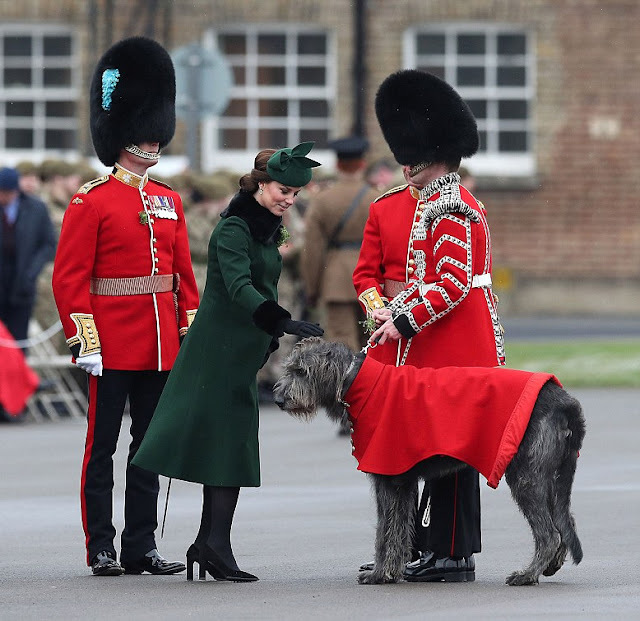 Love all the green and the dog is very fine in red! Hi Gillian, the news is depressing these days right? Or just maddening? I find my blood pressure is a little lower and I feel less rattled on nights when I only watch the weather forecast and skip all the rest!